Music reality shows can never go out of fashion, be it Western or classical. Popular shows include Super Singer on Vijay TV, and on a smaller scale, Swarna Sangeetham, the flagship reality show of Tanishq in collaboration with Raj TV. In its third season, the show will celebrate the golden legacy of the statea��s rich culture in Carnatic music. Judged by popular vocalist, S Soumya and Chitra veena exponent, N Ravikiran, the show will go on air tomorrow. Talking about the show, Ravikiran says, a�?These shows inspire more than, 1000 children. I have been into music for a couple of years and I have performed in more than 40 countries. Carnatic music has a following everywhere.a�? Meanwhile, Soumya shares how she collaborated with Hindustani singer, Ashwini Bhinde. a�?When one wants to collaborate, there needs to be some common ground. I hope to collaborate with jazz musicians,a�? she says, adding, a�?I am a special invitee for this show, which has special episodes on Papanasam Sivan and on Bharathiyar.a�? The singer is known for her improvisation. a�?I generally work on the aalaap. One cannot do much with the raaga, so I improvise the swaras.a�? 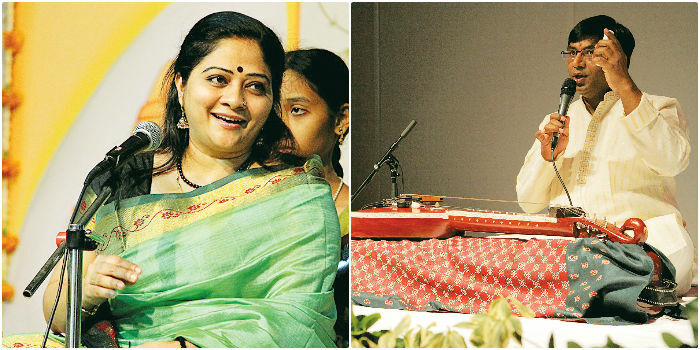 Soumya recently attended the sufi concert, Ruhaniyaat in the city, and is a big fan of ghazals. But she also enjoys music by Indian Ocean. a�?I do go to EDM concerts. I enjoy Sean Roland aka R Raghavendraa��s music. It is an acoustic set up and their lyrics are in Tamil,a�? she concludes.